I found this quote rather poignant as I recalled the past year. In particular it brought to mind three Canada Geese that passed through the doors of Erie Wildlife Rescue (EWR). Wildlife rehabilitators are often asked to explain “why” we try to help wildlife. Frequently, we are confronted by the sentiment of “letting Nature take it’s course”, as if the lives of individual animals have no value. These three geese clearly demonstrate that all too often it is not Nature, but rather the impact of people that is the cause of an animal’s distress, and therefore we have an obligation to try to make things right. The first Canada Goose was found by a young man in early July, unable to walk due to the fishing line wrapped around its legs. The finders called EWR, and arrangements were made to get the goose to the EWR Centre for treatment. The second goose was brought to EWR later in July, by our friends at the Jack Miner Foundation in Kingsville. 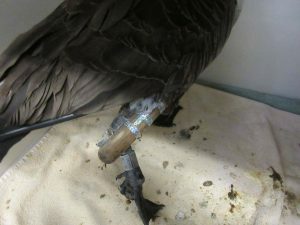 The youngster was also suffering from wounds caused by fishing line. The filament had become so tightly wound and embedded around both ankles that it was cutting off circulation to the feet. For both geese, the fishing line was carefully removed, pain medications and antibiotics were given, time was given to recuperate, and the two birds were successfully released. 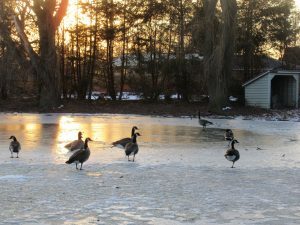 In the case of the third Canada Goose, it was January, and the culprit was not fishing line, but rather a fishing lure. Once again our friends at the Jack Miner Foundation in Kingsville successfully captured the goose and transported it to EWR for treatment. The home-made lure had three treble hooks, with one becoming embedded in the back, one under the wing, and one puncturing the leg at the knee. The goose was unable to walk and was severely underweight. 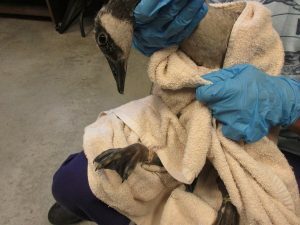 The hooks were carefully removed, pain medications and antibiotics were given, and after a period of time to recover and gain weight, this goose was also returned to the wild. The story of these three Canada Geese clearly demonstrates the toll that people are taking on the environment and wildlife. The work of Erie Wildlife Rescue, and all the other wildlife rehabilitators around the world, may not make huge differences to the overall population of a species, but it certainly makes a difference to that one animal. And when that one animal is harmed because of the human impact to its environment, be it fishing lines, lures, garbage, cars, electrical lines, trapping….the list is endless….it is only right that we help. To the Volunteers, Members and Supporters of EWR, know that your time, efforts and financial support makes a difference to the success of Erie Wildlife Rescue, and in turn IS making a difference…one animal at a time.